I am a self taught beadweaver and have been fascinated by beads my whole life. I became serious about beading 18 years ago. Whether designing, beading or teaching others, I always have a unique new design in the works. A finalist in Beadwork’s Embellished Shoe Show, my “Butterfly World” pump is representative of my love of color and texture. I have always been attracted to beads. It really grew into a passion the first time I saw the book “Those Bad Bad Beads” by Virginia Blakelock. I knew that eventually I wanted to be able to create works of art. The more difficult the piece, the more I enjoy it. I have found that for me beadweaving is a form of meditation. When I feel stressed, all I have to do is pick up my beads and everything else fades into the background. Teaching enables me to share my love and passion for beading with others. It's gratifying to share the feeling of accomplishment a student has upon creating a beautiful piece from a pile of little beads. To that end, I have developed a line of kits and patterns that address all levels of skill. Whether a beginner or an experienced beader, you will find my kits well written with easy to follow directions. Gray Gallery, East Carolina University, "Beadwork II: The Embellished Shoe,"
Greenville, NC, September 2001.McHenry College Gallery and Textile Art Center, "Beadwork II: The Embellished Shoe," Chicago, IL, July 2001. Embellishment Conference, "Beadwork ll: The Embellished Shoe," Portland, OR, July 2001. The Bead Museum, "Beadwork II: The Embellished Shoe," Glendale, AZ, February 2001. 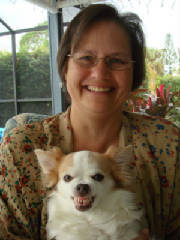 Jenny and the Mad Chiwawa "Gidget"
To maintain the highest quality standards for my products.